On Wednesday evening, a joyride in Kishkinta Amusement Park near Chennai collapsed, killing one and injuring nine others. The joyride, Disco Dancer, was being tested and 25 workers of the amusement park were on board for the trial run. Read more from The Indian Express. Warning: This video shows the collapse of the ride. Oh my god, that's just awful. I'm seeing from the vid that this is not Zamperla's Disk'O, but some knock off. This is why knock offs, however good they look, are not to be trusted. Same thing with phone chargers, knock off Beats headphones, etc.. They've been known to catch fire. Whenever I go to IAAPA I'm always intrigued by the Chinese and, what, Korean? ride manufacturers that offer clear, blatant copies of well-known American and European coasters and flats. I look at them warily, remembering those are the ones reported to have accidents, fires, and what not. Maybe in an effort to cheaply duplicate, standards on other continents aren't as strict. Can you imagine being an employee somewhere and being invited to "test" the new ride then have this happen? Ugh. I wonder if they know of weight appropriate water dummies over there? This is why I admire our Richard Bannister so. He has to be one of the bravest men on earth, right? I've been to Kishkinta, and I actually had a chat with the manager of the park on my trip when I was spotted photographing a pile of unassembled coaster track. He told me that just about all of the rides they had were designed in-house rather than purchased from other companies. I'm guessing this was one of their home-made attractions. Yeah that is horrible. Feel bad for them. It's looks almost identical to the Zamperla we rode at Lake Compounce last season. Smart of them to issue that statement. I'm happy for the ride manufacturers that over engineer their rides. Also having government oversight is a good thing. Safety first. That is absolutely terrible. First, I feel for the family of the guy who lost his life and anyone who was injured. Second, I can't believe that video made it to YouTube and is still up. 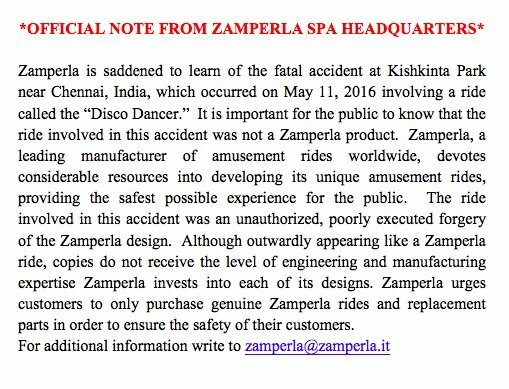 Third, good job by Zamperla getting out in front of this. Their Disk-O is one my favorite flat rides around; it's both laugh-out-loud fun and scares the crap out of me. I hadn't planned on watching the video, but curiosity got the best of me today. As soon as the "impact" moment occurred I had to stop. Knockoff and poor design aside, I can't imagine being on the ride or in the park when something like that occurs. A truly sad moment. Oh man, that looks really bad. I can't believe only one person died. Everyone in that row hitting the ground looks like they would have been crushed. What is with all these horrific accidents lately? Other than this and the Smiler accident last year, what are these "horrific accidents" you speak of. ^Maybe referring to the girl who got "scalped" on the Watkins ride...King's Crown. As we were getting on the Disk'O at Wild Adventures yesterday, Jill said to me "isn't this the same ride we just saw fall into pieces...you sure we want to ride it?" I told her it wasn't the same ride, although it was BASED on the Zamperla ride, then reminded her how soon after the KK incident I was on the Intamin second-gen drop at SFA....and that WAS the same manufacturer. True. I wasn't even thinking about the scalping. The news stories I read just paint such a dramatic picture of the safety of thrill rides. 99 times out of 100, there is *always* a logical explanation for these things that the news never decides to report. Going to the Sheikra evac from last week, "harrowing" and "dangerous" were words I saw used more than once in news articles. When in reality, the ride likely had some sort of sensor issue that caused a block stop and the ride did what it was supposed to do, as did the crew in the evac. Even the horrible accident on Smiler last year, while terrible and avoidable, had a logical explanation for occuring. Someone overrode the ride and put it into manual mode, and the blocking system was no longer doing its thing. The drop tower accident at Kentucky Kingdom all those years back was definitely one of the scariest situations I can think of in recent times. I just get tired of the sensationalist approach the media gives this stuff.